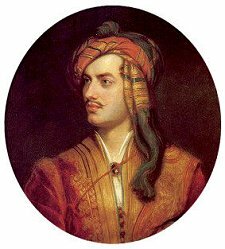 Lord Byron — the 6th Baron Byron — club-footed, handsome, notorious, whose full name was George Gordon Noel Byron, surely as much a genius of personality as he was of poetry, was born January 22, 1788. He died, just over thirty-six years later (April 19th, 1824) in Greece, where he’d gone to join the revolution — specifically, the Greek struggle to liberate from Turkey. “He was only thirty-six when he died, yet he had already grown overweight and flaccid, with thinning hair and abominable teeth. Nonetheless, every second town in Greece would name a public square after him,” wrote the critic Harold Bloom. George Gordon Noel Byron, 6th Baron Byron, RIP.